Man wounded by Ankara police after refusing orders to halt while driving tractor towards Israeli ambassador's house. 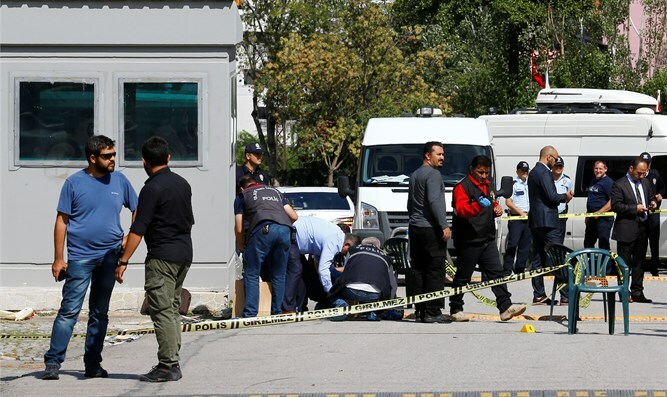 A man driving a tractor near the home of the Israeli ambassador in Ankara, Turkey was shot Tuesday morning, Turkish media outlets reported. According to a report by Maariv, the driver, who has been identified as 45-year-old Aydin Sakarya, refused to respond to police demands that he stop his vehicle, and continued driving towards what was initially reported as the Israeli embassy compound. Ankara police opened fire on Sakarya, wounding him in the leg. Police took the suspect into custody for questioning. The Associated Press earlier reported that the driver was shot near the Turkish parliament building. Later on Tuesday, the Israeli Foreign Ministry clarified that the incident took place near the Israeli ambassador’s residence, not the embassy itself. According to a report by Turkey’s Anadolu media outlet, the driver told investigators he had wanted to drive to the Israeli embassy to stage a protest. On Monday, Turkish security forces evacuated the Iranian embassy in Ankara, following a suicide bomb threat.